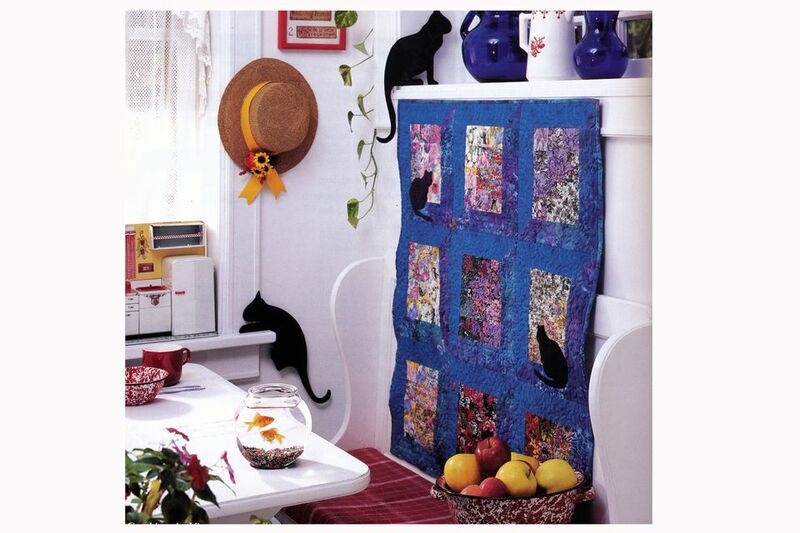 Use my watercolor style cat quilt pattern to make a 33-1/2" x 39-1/2" quilt. Three appliqued cats are inspecting a flower garden outside the watercolor style windows, but keeping an eye on the butterflies that have drifted indoors. The quilt blocks are similar to attic windows, but with four mitered frames instead of two, and they're filled with floral scraps in the watercolor style. Create more contrast and depth by using frame fabrics with a bit more color value differences than mine. Sew all patchwork with an accurate quarter inch seam allowance. Cat and butterfly appliqué pieces do not include a seam allowance. Cut 1 crouching cat from dark fabric. Turn the pattern over and cut a mirror image crouching cat. Cut 1 standing cat from dark fabric. Cut as many butterflies from a template as desired. or cut butterflies from a printed fabric, leaving a seam allowance. Turn under edges and applique to the quilt. If these techniques are new to you, it's a good idea to assemble one block before cutting all of your fabric. Use the 3" wide medium-light fabric strips to create the top and left frames. Rotary cut a top frame that's 12-1/4" along its longest edge and create a 45-degree angle at each end. Cut eight more top frames. Use the same technique to cut nine side frames from the remaining medium-light fabric strips. Each side frame should have 45-degree angled ends and measure 14-1/4" along its longest edge. Repeat for the remaining frames, cutting nine tops and nine sides from the dark strips. Mark seam intersections on the reverse side of each strip, near the ends of short sides. It's easy to do that by measuring and marking 1/4" inward near corners on the short bottom, then along angled side edges. Arrange the dark and medium-light frames on a design wall or in an area where you can step back for a good look at them. You'll have three frames across and three down—refer to the picture on page 5. Place 12 floral squares within each rectangular opening created by the frames—three squares across and four down. You may need to overlap some squares to fit them into the frames. Step back. Do you like the arrangement of the squares? Is there a better layout? Shift the squares around until you're satisfied with each window's appearance. Use straight pins to secure patchwork during all sewing steps. Sew squares in each window together in rows. Press seams in adjoining rows in opposite directions and then sew the rows together, matching seams carefully. Press each floral block. Use a chalk pen or other removable marker to mark seam intersections 1/4" inward at the corners of each block. Sew a medium-light top and a dark side frame together along their 45-degree ends, beginning at the outer point. Stop sewing at the inner, marked seam intersection. Backstitch and remove from the sewing machine. Press seam open. Sew a medium-light side and dark bottom frame together in the same way. Press the seam open. Place the block right side up sideways, bottom rows to the right. Place a bottom/side frame unit on top, right side down, the dark bottom frame aligned against the right edge of the floral. Pin-match the marked seam intersections. Begin sewing at the marked intersection of the dark frame, with the frame on top as you sew. Stop sewing when you reach the seam intersection on the opposite side--where the slit appears in the seam used to connect the frames. Leave the unit in the machine and keep the needle down. Raise the presser foot and pivot the unit. Match seam intersections on the ends of both patches and then match edges along its entire length. Continue sewing, ending the seam at the marked intersection. Backstitch and remove from the machine. Press seam allowances towards the frames. Sew the medium-light top and dark side frame to the rectangle, in the same way, beginning the seam at the top left side of the upper sill. Press new seams towards the frames. Sew the unsewn diagonals to connect dark and medium-light frames, beginning at the point where seams meet on inner edges. Repeat all steps to assemble nine blocks. Arrange the blocks into three rows as shown on page 1. Sew the blocks in each row together. Press seam allowances in adjoining rows in opposite directions, then sew rows together, matching seam intersections carefully. Press the quilt. Decide how many cats you would like. Make templates as needed for the appliqué technique you plan to use, then prepare the fabric for applique. Flip templates over to create mirror-image cats. Decide how many butterflies you would like and create templates as needed for the applique technique you've chosen. The simple shape can be cut and appliqued from one fabric. An easy and colorful alternative is to cut butterflies from a printed fabric and applique them to the quilt. Appliqué shapes to the quilt by hand or machine. Mark the top for quilting if necessary. Sandwich with batting and backing. Baste the quilt and quilt as desired. Trim excess batting and backing. Make doublefold binding strips and sew binding to the quilt with mitered edges. This full view of the quilt will help you arrange the patchwork and applique.